Summer is becoming a fading memory. Although we are still experiencing the last of summer, autumn is tentatively making her presence felt. This weaving of seasons new and old seems to be reflected in the projects that are taking form. 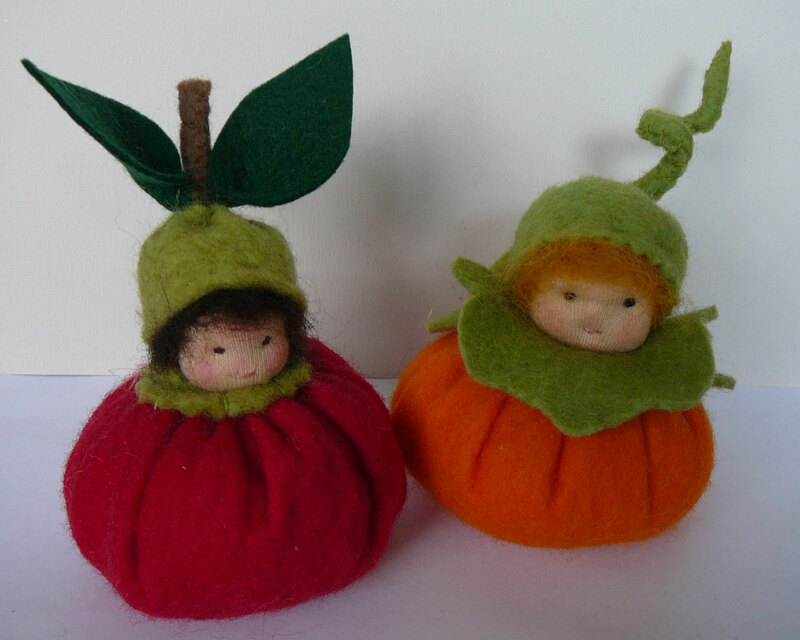 For instance a pumpkin child and an apple child have appeared, followed rather quickly by a gracious Strawberry Maiden letting me know that Summer is not yet quite done. Perhaps, too, a little symbolic as strawberries are tiny heart shaped delights; fruits of heart, one could say. And fleeting she was . 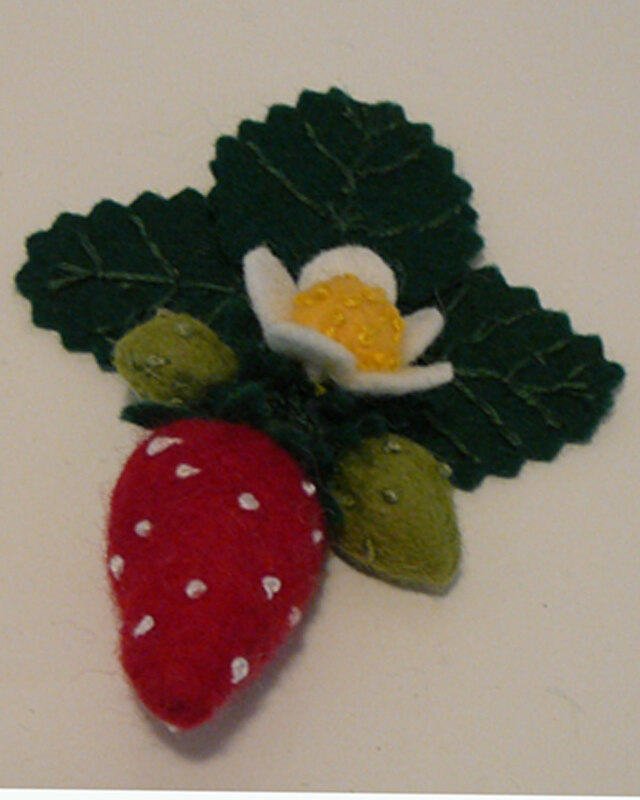 The Strawberry maiden has already departed without a photo aside from her little fruity offering. It is always good to be challenged and to have to take a step into areas not yet explored, like producing a pattern; testing indeed. So for now as words are juxtaposed with ideas and images overlaid by a degree of stress and frenzy, I shall just share some images of these seasonal pieces. 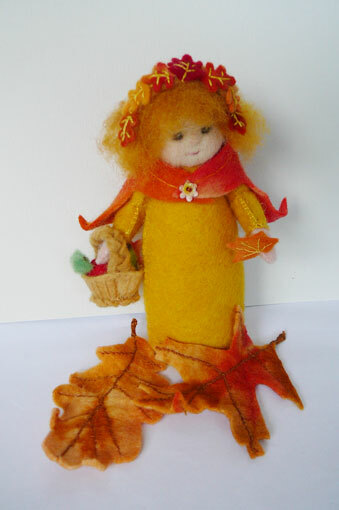 Another Autumn inspiration came as a Harvest maiden carrying a basket containing a teeny apple and pear and coloured maple leaf. 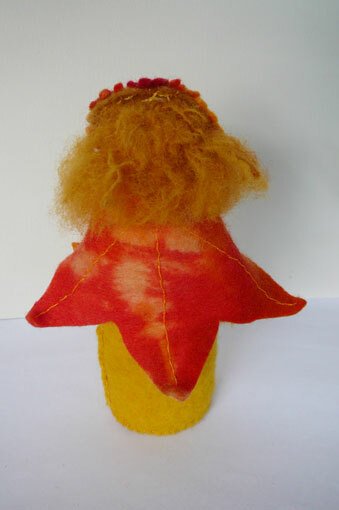 Her hair is wreathed with tiny leaves; these are an inspirational offshoot of Autumn gnome. Oh my, you are clever! I haven’t popped in for a while and now suddenly I see such quaint Little People inhabiting your space! I love these but I especially love the gnomes in your previous post. My Austrian heritage definitely gives me a sense of gnomes and small folk ‘belonging’ in my world! Thank you – I love seeing your inspirational work! Your charming little maiden has found a warm nice loving home with us. She is surrounded by a beautiful natural environment, with some other of your amazing creations. As I am reading through your blog I wonder what inspires me the most… your art with hands or your art with mind, soul? (and your heart work of course). Much love going your way, take care. Beautiful! I especially love the leaf cloak. Thanks for linking up to Waldorf Wednesday. Hope to see you again this week! thankyou,autumn leaves fascinate.And thankyou for the invitation- done.